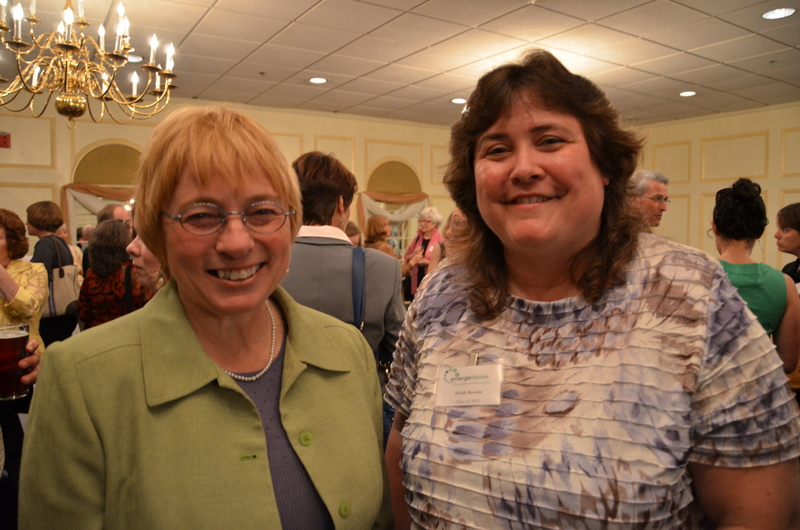 June 20th was a special day, as Emerge Maine celebrated their 2013 Woman of the Year, Attorney General Janet Mills of Farmington, and 2013 Rising Star Dr. Heidi Brooks of Lewiston at a fete at Augusta’s Senator Inn. Janet Mills, Maine’s current Attorney General, is nothing short of a living legend in Maine politics. She served 4 terms in the Maine House of Representatives before becoming the state’s first woman Attorney General in 2009 under Governor John Baldacci. She served as the Maine Democratic Party’s vice chair the past few years and resumed her former position as Maine’s Attorney General earlier year. A lifelong resident of her beloved Farmington, Mills is an alumna of UMass Boston and University of Maine School of Law. Janet is married to Stanley Kuklinski, with whom she has five stepdaughters and three grandsons. This is the inaugural year for the Rising Star award. Its first recipient, Dr. Heidi Brooks of Lewiston, is a 2012 graduate of the Emerge Maine program, who in her capacity as a physician believes that healthcare is a basic human right and has seen firsthand the consequences of not providing healthcare early enough to prevent illness. To that end, Heidi currently volunteers as Co-Chair of Maine People’s Alliance Board and as Secretary of both the Maine Democratic State Committee and the Androscoggin County Democratic Committee. She was recently appointed to the Lewiston Community Development Block Grant Citizens Advisory Committee and elected to the local Head Start Board. Emerge Maine is part of a national network, Emerge America, that is currently working in eleven states: Arizona, California, Colorado, Kentucky, Maine, Maryland, Massachusetts, Nevada, New Mexico, Oregon and Wisconsin. Now in its twelfth year, Emerge Maine has graduated 120 Demcoratic women with 9 currently serving in the 126th Legislature, including freshmen lawmakers Katherine Cassidy, Mattie Daughtry, Sara Gideon, Catherine Nadeau and Lisa Villa. Past recipients of Emerge Maine Woman of the Year award include current Maine House of Representatives Clerk Millie MacFarland (2010), former Senate President/ Speaker of the House/ 2010 Maine Democratic gubernatorial candidate Libby Mitchell (2011) and U.S. Congresswoman Chellie Pingree (2012).